Danbury's Gino Baratta is turned over by Southington's Paul Calo during Class LL Wrestling Championship action in Trumbull, Conn. on Saturday Feb. 17, 2018. TRUMBULL — Chalk up another Class LL state championship for the Danbury High School wrestling team, the Hatters third straight and fourth in six years. The Hatters sent a tournament-high six wrestlers to the finals, claimed five individual titles and placed 11 in the top six. Danbury scored 274 points to win the title, and was followed by Warde in second with 200, Trumbull and Southington in a tie for third with 175 apiece, and East Hartford in fifth with 117. For the Hatters, Ryan Jack won his second consecutive Class LL title, winning the 120-pound final by major decision; he had won the 106-pound title last year. Kyle Fields won an overtime thriller in the 132-pound final. A.J. Kovacs won the 145-pound title with a first-period pin in the title bout. Gino Baratta won a grueling overtime battle against a reigning New England champion in the 170-pound final. Ben LeBlanc won the 113-pound title by decision. Their dominance has the Hatters feeling confident heading into next weekend’s State Open. Sending 11 wrestlers out of 14 weight classes to the State Open is itself an impressive feat. Other local champions included Aaron Occhipinti of Newtown at 126, Matt Ryan of Trumbull at 138, Kris Gjinaj of Warde at 152, Izaake Zuckerman of Warde at 160, Joe Palmieri of Trumbull at 182, Brett Nutter of Trumbull at 195 and George Harrington of Staples at 285. Also for Danbury, Montez Osbey took second at 220 despite a valiant effort deep into overtime in the title bout. Tyler Johnson (106) and Jordan Agosto (285) both took third, A.J. Caba (138) and George Estevez (182) both placed fourth, Nic Savo (126) placed sixth. Danbury’s Fields trailed Warde’s Alex Steele 3-2 with the final seconds of regulation time ticking away in the 132-pound final. With three seconds to go, Fields scored a two-point takedown to take the lead, but only briefly, as Steele escaped with one second remaining to tie the score and force overtime. With only three seconds remaining in the first, sudden-death overtime period, Fields struck again with a championship-winning takedown. Trumbull’s Ryan scored a takedown with 25 seconds remaining to break a 6-6 tie and take the lead for good in the 138-pound title bout. After missing all of last season with a torn knee ligament, Warde’s Gjinaj came back with authority this year. He won the 152-pound final by decision. “It was a great victory,” Gjinaj said. “This is the way I wanted to finished. For Staples’ Harrington, one final escape after an exhausting overtime battle in the 285-pound final sealed the title. Also for Warde, Steele (132) and Joe Gjinaj (195) both took second, Noah Zuckerman (138) took third, Cole Shaughnessy (120) placed fourth, and Nathan Cuoco (126) and Anthony Zarlenga (145) both took fifth. For Trumbull, Jack Ryan (106) and Jonathan Kosak (126) both placed second, and David Castaldo took fourth at 132. Westhill’s William Chase Parrot took second at 120, Thomas Mazur placed third at 126, Christian Bier finished fifth at 285, and Alex Edwards took sixth at 138. For Newtown, Joe Zeller took second at 285 after fighting a grueling battle in the title match. Nikolas Accousti placed third at 132 and Owen Walsh took fourth at 152. Greenwich’s Andrew Nanai took third at 182, Carlos DeWinter took sixth at 113, Jackson Blanchard finished sixth at 170, and Ryan Merida took sixth at 195. George Tsiranides of Fairfield Prep placed second at 145. Ridgefield’s Lazar Agoev took second at 152, Simon Preston placed second at 160, and Benjamin Smart placed third at 120. Stamford’s Garey Mendez placed third at 145, Jake Heerman took third at 170, and Ibrahim Abdul-Hakeem finished sixth at 160. Shelton’s Ray Weiner placed third at 195. Norwalk’s Jakari Walker took fourth at 170, Dante Solano finished fourth at 220, and Samuel White placed fifth at 120. Staples’ Terry Brannigan placed fifth at 113. McMahon’s Jonathan Davila placed fifth at 160 and Jeffrey Cocchia took fifth at 195. Team scores: 1. Danbury 274; 2. Warde 200; 3. (tie) Trumbull and Southington 175; 5. East Hartford 117; 6. Simsbury 112; 7. Ridgefield 93.5; 8. Newtown 91; 9. Manchester 87; 10. Westhill 76; 11. Greenwich 75.5; 12. Stamford 69; 13. Norwich Free Academy 67.5; 14. Glastonbury 63; 15. Norwalk 61; 16. New Britain 59; 17. Staples 53; 18. Enfield 51.5; 19. McMahon 44.5; 20. Fairfield Prep 38; 21. Conard 36; 22. Shelton 31; 23. Cheshire 15; 24. New Haven 13. 106: Championship: Thomas Finn, Simsbury dec. Jack Ryan, Trumbull 5-2; Third: Tyler Johnson, Danbury pinned Martial Sutton, Glastonbury 0:49; Fifth: Caleb Brick, Southington pinned Elijah Pelkey, Enfield 0:51. 113: Championship: Ben LeBlanc, Danbury dec. Parker Sutton, Glastonbury 8-3; Third: Lowayne Harris, East Hartford dec. Saul Pera, Simsbury 3-2; Fifth: Terry Brannigan, Staples major dec. Carlos DeWinter, Greenwich 17-5. 120: Championship: Ryan Jack, Danbury major dec. William Chase Parrot, Westhill 13-3; Third: Benjamin Smart, Ridgefield pinned Cole Shaughnessy, Warde 0:21; Fifth: Samuel White, Norwalk pinned Dominic Renfree, Norwich Free Academy 2:11. 126: Championship: Aaron Occhipinti, Newtown dec. Jonathan Kosak, Trumbull 6-3; Third: Thomas Mazur, Westhill dec. Jacob Cardozo, Southington 7-0; Fifth: Nathan Cuoco, Warde pinned Nic Savo, Danbury 2:30. 132: Championship: Kyle Fields, Danbury dec. Alex Steele, Warde 6-4 OT; Third: Nikolas Accousti, Newtown dec. David Castaldo, Trumbull 5-4; Fifth: Jason Brault, Southington pinned Elijah Watson, New Britain 5:04. 138: Championship: Matt Ryan, Trumbull dec. Shamar Schand, Manchester 8-7; Third: Noah Zuckerman, Warde dec. A.J. 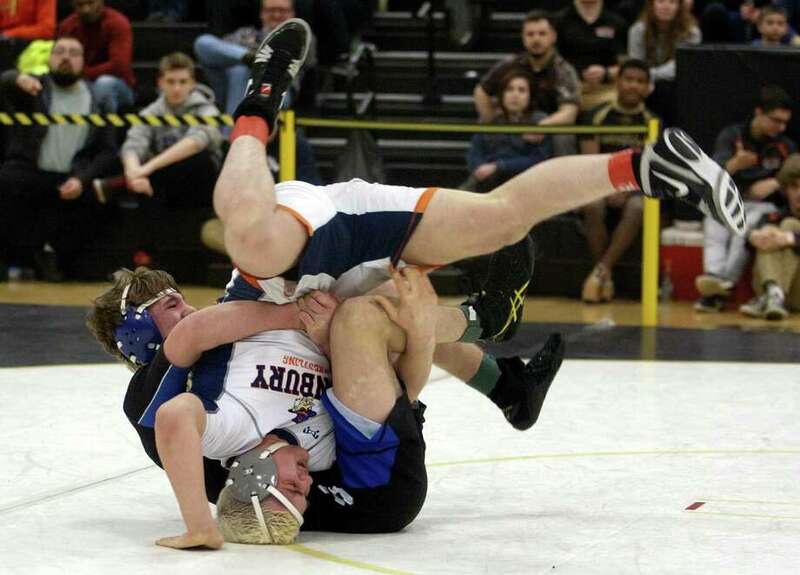 Caba, Danbury 4-3; Fifth: Shaun Wagner, Southington dec. Alex Edwards, Westhill 8-2. 145: Championship: A.J. Kovacs, Danbury pinned George Tsiranides, Fairfield Prep 0:52; Third: Garey Mendez, Stamford pinned Timothy Roberts, East Hartford 4:21; Fifth: Anthony Zarlenga, Warde dec. Traivon Nieves, Manchester 1-0. 152: Championship: Kris Gjinaj, Warde dec. Lazar Agoev, Ridgefield 6-2; Third: Tagan Welch, Southington pinned Owen Walsh, Newtown 1:56; Fifth: Theran Vanasse, Norwich Free Academy tech. fall Jasen Gonzalez, Manchester 18-2. 160: Championship: Izaake Zuckerman, Warde pinned Simon Preston, Ridgefield 3:05; Third: Eric Rodonis, Conard dec. William Carr, Southington 7-2; Fifth: Jonathan Davila, McMahon major dec. Ibrahim Abdul-Hakeem, Stamford 9-1. 170: Championship: Gino Baratta, Danbury dec. Paul Calo, Southington 2-1, OT; Third: Jake Heerman, Stamford major dec. Jakari Walker, Norwalk 14-3; Fifth: Nate Chesworth, Enfield pinned Jackson Blanchard, Greenwich 2:29. 182: Championship: Joe Palmieri, Trumbull dec. Jackson King, Simsbury 4-3; Third: Andrew Nanai, Greenwich pinned George Estevez, Danbury 1:43; Fifth: Marc Thelusma, Norwich Free Academy, by forfeit over Joshua Atkins, Manchester. 195: Championship: Brett Nutter, Trumbull dec. Joe Gjinaj, Warde 3-2; Third: Ray Weiner, Shelton pinned Isaiah Medina, New Britain 2:20; Fifth: Jeffrey Cocchia, McMahon pinned Ryan Merida, Greenwich 2:04. 220: Championship: Isaiah Jiminian, East Hartford dec. Montez Osbey, Danbury 3-1, OT; Third: Jacob Vecchio, Southington, pinned Dante Solano, Norwalk 2:20; Fifth: Kamren Snodgrass, Norwich Free Academy, dec. Nathan Keegan, Manchester 6-2. 285: Championship: George Harrington, Staples dec. Joe Zeller, Newtown 3-2, OT; Third: Jordan Agosto, Danbury pinned Anthoneil Phillips, East Hartford 1:27; Fifth: Christian Bier, Westhill by forfeit over Biliaminy Affini, Manchester.